On October 21, 2003, it was announced that a huge concert would be held in Cape Town, South Africa to raise awareness of Africa’s AIDS plight. The initiative, called 46664 represented Nelson Mandela’s prison number for more than 18 years while he was a prisoner in Robben Island in South Africa. Mandela explained the use of the number, “Millions of people today infected with AIDS are just that — a number,” he said. “They too are serving a prison sentence for life. That’s why for the first time I am allowing my prison number…to brand this campaign.” The concert had initially been planned for earlier in 2003 but had been pushed back to coincide with World AIDS Day. The concert was streamed on the internet, and was later televised to the world. The campaign took it’s name from another source, David Stewart of the Eurythmics had started working with Joe Strummer of the Clash and later Bono on a song in 2002. 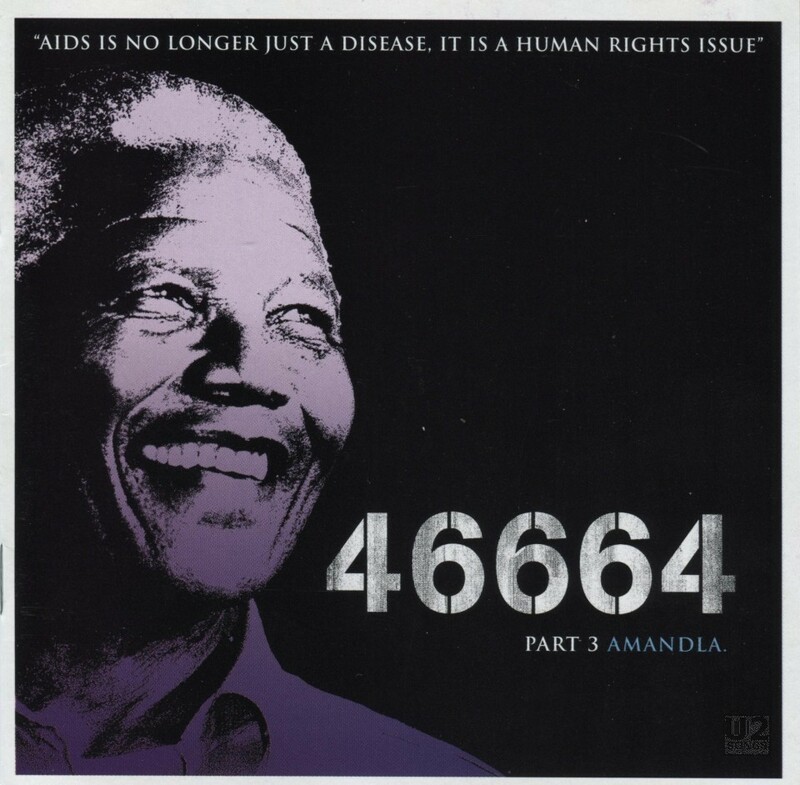 The song was titled “46664 (Long Walk to Freedom)”. Dave Stewart had approached Nelson Mandela in November 2002 about using the number for the basis for a song, and explained his desire to use the proceeds from the song for raising money for the Nelson Mandela Foundation. Stewart first approached Joe Strummer of The Clash to co-write the lyrics to the song, but after Strummer’s death Stewart finished the song with Bono. The two recorded the song with Youssou N’Dour and Abdel as the first in a series of songs for the campaign which would eventually be launched. It was released as a digital single in October of 2003. The concert was released on DVD, as well as on CD. Rather than releasing a pricey 3-disc set, the record label released three separate discs, each with a subtitle, “African Prayer”, “Amandla” and “Long Walk to Freedom”. Each disc was released with a picture of Mandela on the cover, although tinted different colours to make telling the difference between the CDs easier. The third disc was titled “Amandla” after a song written by Stewart and Queen and Anastacia for this concert. In concert Bono also performed on the song. This CD contains a number of U2 moments, the first being a performance by Bono and the Edge of “One” into “Unchained Melody”. During the performance, they are joined on stage by The Soweto Gospel Choir although they are not credited on the CD. Bono introduces the song speaking of his friend Portia who had died from AIDS just the day before as he lights a candle and places it on top of a monitor. This performance of “One” would later be released by the Soweto Gospel Choir on their album “African Spirit” but without the “Unchained Melody” at the end. The second song featuring U2 content on the disc is Bono joining a group of performers including Queen, Anastacia, Beyonce and David A Stewart on stage for the song “Amandla”. “Amandla” had been written by Stewart and Queen with help from Anastacia for this concert. They are also joined on stage by Andrews Bonsu who gives a short speech during the performance. At one time this discography aslo included the song “We Are the Champions” as including possible U2 content. However, upon repeated viewing of the DVD we can find no evidence that Bono nor the Edge are on stage during this penultimate song of the concert. During the song most of the performers from the night rejoined Queen on the stage for a performance of “We Are the Champions”. The final track performed at the concert is “46664 Chant” which is performed by the gathered cast from the concert. Bono and The Edge again seem to be absent on stage when one reviews the DVD of the performance. The song however is listed as being co-written by Bono and thus is considered U2 content for the purposes of the discography. The chant is taken from the song “46664 (Long Walk to Freedom)” which had been written by Dave Stewart, Joe Strummer, and Bono. This chant consists of the choir and cast singing “It’s a long walk to freedom” repeatedly and then adding a chant of “46664” to the end of the song as a performer sings Mandela’s name over the chants. Performed by Bono and The Edge. Written by Hewson, Clayton, Evans, Mullen, North, Zaret. Recorded by Justin Shirley-Smith and Toby Alington. Mixed by David Richards and Josh Macrae at Moutain Studios (Montreux Switzerland) and The Priory (Surrey, UK). Performed by Queen, Bono, Anastacia, David A. Stewart, Andrews Bonsu. Written by Stewart, Anastacia, May, Louw, Prayer by Andrews Bonsu. Recorded by Justin Shirley-Smith and Toby Alington. Mixed by David Richards and Josh Macrae at Moutain Studios (Montreux Switzerland) and The Priory (Surrey, UK). Performed by Soweto Gospel Choir and Cast. Written by Strummer, Hewson, Stewart. Recorded by Justin Shirley-Smith and Toby Alington. Mixed by David Richards and Josh Macrae at Moutain Studios (Montreux Switzerland) and The Priory (Surrey, UK).